Professor Hari Reehal joined LSBU from BP Research (Sunbury) where he led research groups working in the areas of photovoltaics, novel thin film materials, coatings and surface science. Prior to this he was a Lecturer in Applied Physics at the University of Bradford. At LSBU he has held various positions, including Director of Research in the former Faculty of Engineering, Science and the Built Environment and the Department of Engineering and Design. He was also Head of the Centre for Advanced Materials. 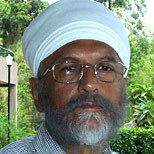 Hari is currently an Emeritus Professor in the School of Engineering and a member of the Centre for Advanced Materials. Current research is focused on (i) novel electronic and functional materials for renewable energy generation using PV devices or solar cells and (ii) the application of PV. Thin film crystalline silicon cells on cheap substrates as a lower cost replacement for conventional silicon wafer technology which currently dominates the PV market. Plasmonic solar cells. The aim here is to incorporate nanoscale metal particles into thin crystalline silicon solar cells to increase light absorption and improve cell efficiency. Nano- and micro-wire silicon solar cells. In these the device junctions are radial. This and the excellent light trapping properties of these structures are promising for increased cell efficiencies and reduced material use. Thin film transparent conducting oxides and new low cost materials for PV. Research in PV applications includes modelling and experimentally studying the performance of different PV modules and systems. The research is supported by a comprehensive range of experimental facilities for thin film growth, device processing and characterisation including a class 10,000 clean room. Funding has been attracted from the EPSRC (including the PV 21 SUPERGEN consortium), the Leverhulme Trust and industry. Hasnath, A and Reehal, HS and Ball, J The Effect of Process Parameters of Plasma Sulphurisation on the Morphology of CZT Precursors. In: 14th Photovoltaic Science, Applications and Technology, 18 April 2018 - 19 April 2018, Imperial College, London. Cabrera Espana, FJ and Agrawal, A and Reehal, HS and Oates, A Hut-Like Pillar Si Solar Cells. In: Conference on Lasers and Electro-Optics, 05 Jun 2016 - 10 Jun 2016, San Jose, CA, USA. Oates, A and Reehal, HS Proximity rapid thermal diffusion for emitter formation in silicon solar cells. In: 12th Photovoltaic Science, Applications and Technology Conference C98, 6-8 April 2016, Liverpool.